Ideal Industries 2-Pole Heavy-duty toggle switch has voltage rating of 125/277-Volt AC and current rating of 20-Amps at 125-Volts/10-Amps at 277-Volts. It withstands dielectric voltage rating of 1500-Volts. 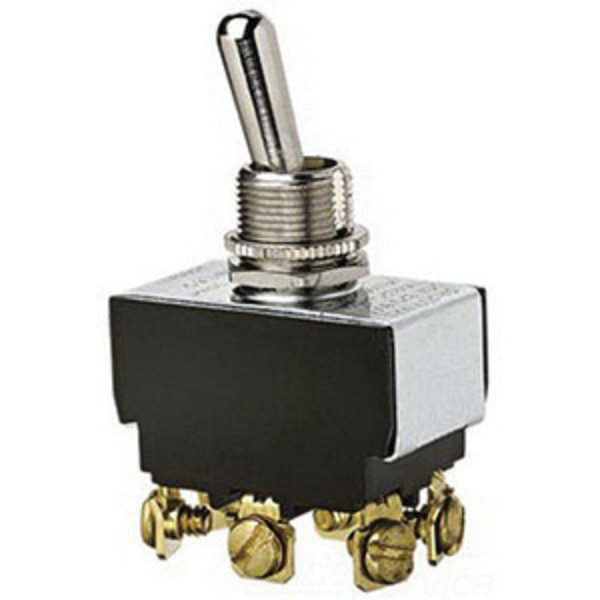 DPDT Switch with screw connection, has rugged long-wearing solid brass/nickel-plated bushings. It has maximum load capacity of 1-1/2 hp at 125 - 250-Volt AC. It measures 1.3-Inch x 0.76-Inch x 0.8-Inch. It is ideal for power tool and motor control switch applications. Switch operates at temperature range of 0 to 85 deg C. Toggle switch is UL listed and CSA certified.